If you haven't seen Lady Gaga's "Born This Way" video then you might not have come across Zombie Boy yet. 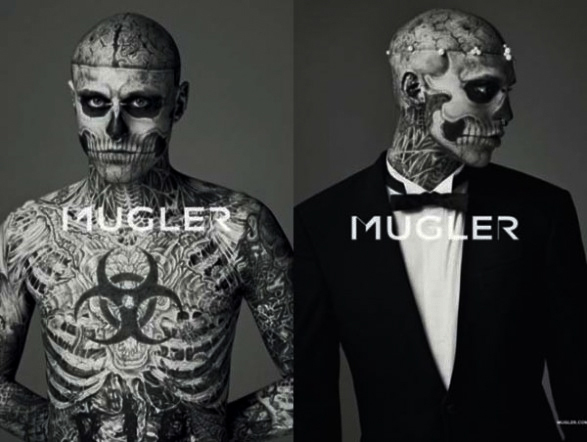 Rick Genest aka "Zombie Boy" was discovered by Lady Gaga's stylist and Mugler creative director Nicola Formichetti on Facebook. Now, he's a men's wear muse, has walked the runway, starred in Lady Gaga's video, been written about in countless articles including a few in The New York Times, and won two Guinness Book of World Records for the most tattooed bones and the most tattooed insects. Wow, amazing how a few tattoos (ha ha) and Facebook can change your life and career overnight. I have a feeling we'll be seeing a lot more of Zombie Boy. A bit thrown off or scared by his look? You can see a softer side of Rick in this cute male model lip-sync video where he has a 2 second cameo.